We lamented the decision by Forbes to discontinue their annual Best Small Companies list last year. 36 years in the running, the list provided a number of actionable opportunities over the last couple of decades for many of us. That said, while sticking to their core criteria, we may have actually improved the discovery and screening process. The returns posted by the lists, orphaned for two years now, have been 19.0% and 21.6%, respectively. For context, the Wilshire 5000 checked in at approximately 4% for both periods. With this experience under our belts, we head for the haystack in search of promising smaller companies to bolster our all-of-the-above investing discipline and hoping for a solid January Effect. The Russell 2000 (RUT) gained 2.5% from 10/31/2015 through Halloween 2016. The Wilshire 5000 (VTSMX) did a little better, checking in at 4.1% during that same period. Every Halloween, we remind our fellow investors to be extra vigilant for opportunities among smaller, faster-growing companies, during the 4th quarter of the year. History suggests that some opportunities are created by tax-related selling. The smaller companies are impacted the most and those with solid expectations often get a stock price boost during January when investors return after wash sale periods expire. It’s also a time when we are reminded that small cap does not mean small company. As a case in point, the average sales growth forecast for the Russell 2000 (EQWS) is approximately 6.0% — the type of growth more closely associated with stalwarts and larger blue chip contributors. If you’re really looking for small companies, we suggest an emphasis on higher growth rates. This month’s fund feature is Conestoga Small Cap (CCASX) featuring an average sales growth rate of 13%. Go ahead. Check out the companies held by Conestoga. (See page 4.) In a word, they obviously shop for leadership small companies in much the same way that we do and can/should be considered a qualified source of ideas. Conestoga features a +2.4% (annualized) excess return versus the S&P 500 over the last ten years. The criteria used to build the list is largely faithful to the Forbes traditions. Specifically, annual revenues were limited to less than $1 billion, but required to be greater than $50 million. We also required a minimum stock price of $5. Because we feel the sales growth forecast is the strongest characteristic to define “small” — we required a minimum growth forecast of 10%. No asset-based companies from the financial sector were included. And finally, when we think about “Best” we think the combination of quality and return forecast is a great place to start. The companies that qualify for our 2016 Best Small Company Manifest are shown in the accompanying table. Diagnostics as a “theme” are fairly prevalent among the best small companies. Solomon Select feature Mesa Labs (MLAB) is one example and Mid-Michigan local favorite, Neogen (NEOG) is another. Both of these companies were “discovered” via the Forbes list and continue to qualify. Another company that qualifies as biopharma-enabling might well be Simulations Plus (SLP) but the company falls a little short of the annual revenues minimum. We expected to lose last year’s #1, Forward Air (FWRD) to “graduation” but the recessionary conditions in transporting “stuff” kept FWRD below the $1 billion maximum. Forward Air had been a resident of the Forbes listing for seven years … so this makes it nine years for this logistics leader. The top performer from last year’s best small companies was Ubiquiti Networks (UBNT) with a total return of 79.7%. Ubiquiti develops high performance networking technology for service providers and enterprises. UBNT is closing the digital divide by building network communication platforms and has 38 million devices worldwide. Ubiquiti just missed qualifying for this year’s list — ranking #41 as the UBNT return forecast is down to 7.9% following the robust performance over the last year. 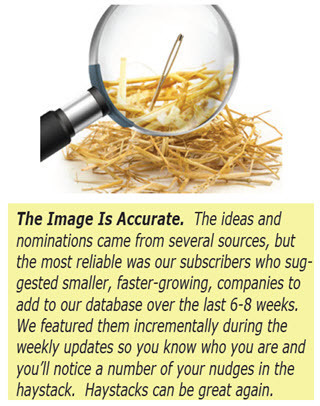 We think a ubiquitous haystack is a path to opportunity and success. We’re reminded that we can’t achieve proper balance unless we’re continuously searching for the next promising well-managed small company. We’re reassured by the presence of several long time favorites on this study list and look forward to discovering and diagnosing at will.